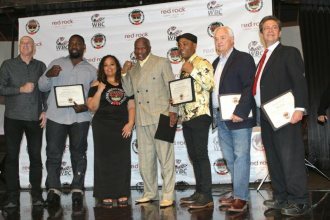 LAS VEGAS, NV (March 19, 2019) - A diverse and glittering array of boxing greats will be honored with induction into the Nevada Boxing Hall of Fame at the 7th Annual Induction Weekend spectacular August 9th and 10th 2019 at Red Rock Casino Resort and Spa in Las Vegas. The partnership with the Red Rock Casino and Spa is just the beginning of a wonderful relationship with the NVBHOF. The Inductees were announced at a press conference hosted by NVBHOF Founder Rich Marotta and 2014 NVBHOF Inductee, "Colonel" Bob Sheridan. CEO and President Michelle Corrales-Lewis said, "I'm extremely excited about this year's Class. I feel it's one of our most glamorous ever!" BERNARD "THE EXECUTIONER" HOPKINS: The magnificent "Executioner" won multiple world titles in the middleweight and light heavyweight divisions including 20 successful defenses of 160 pound title. Hopkins was the first male boxer to simultaneously hold world titles from four sanctioning bodies and became the oldest boxer ever to win a world championship fighting in his 50's. JUAN MANUEL "DINAMITA" MARQUEZ: Considered one the greatest Mexican champions of all time. A superb counter-puncher and technician and was willing to slug it out as well, hence his nickname "Dinamita". Marquez engaged in an iconic 4-fight series With Manny Pacquaio, all of them in Las Vegas, and won World Titles in 4 divisions. RONALD "WINKY" WRIGHT: Master ring general who could use all 20 feet of the ring to out-think, out-maneuver and out-hustle his adversaries. Strong resume included Wins over Trinidad, Mosley and Quartey. HUMBERTO "CHIQUITA" GONZALEZ: One of the hardest punching lighter-weight boxers at 108 lbs ever. Won 2 of 3 in epic trilogy with Michael Carbajal, losing only a sensational Vegas battle in which he scored two knockdowns. VINNY "THE PAZMANIAN DEVIL" PAZ: The Pazmanian Devil, winner of multiple world titles and a 1994 decision over Roberto Duran in Las Vegas. His unique story includes an incredible comeback from auto accident resulting in a broken neck, chronicled in the movie "Bleed for This". "TERRIBLE" TERRY NORRIS: The true epitome of "boxer-puncher" was a Las Vegas regular With 14 fights in Nevada. Possessor of great hand and foot speed, he KO'd champs like John Mugabi, Donald Curry, Meldrick Taylor, and Simon Brown among others and won a Decision over the legendary Sugar Ray Leonard. "SCHOOLBOY" BOBBY CHACON (Posthumous): Immensely popular champion who engaged in Fight of the Year in both 1982 vs Bazooka Limon and '83 vs Cornelius Boza-Edwards. JOEL "EL CEPILLO" CASAMAYOR: Fought 12 times in Nevada. A clever, wise fighter who knew all the tricks. He held the WBA 130 pound and WBC 135 pound world titles. Won 2 of 3 in epic trilogy with Diego Corrales. Had nearly 400 fights as an amateur and won 1992 Olympic Bantamweight Gold Medal in Barcelona with victory over Wayne McCullough. Would've been 1996 Olympian as well but defected from Cuba just before Olympics. Longtime resident of Las Vegas, now working training kids. WAYNE "POCKET ROCKET" McCULLOUGH: One of Ireland's most famous and popular fighters and lived in Las Vegas throughout and after his career. He had storied amateur career of about 350 fights. Made it to finals of 1992 Olympics where he lost decision to Joel Casamayor. He returned to Ireland with Silver Medal as major hero. After just two years as pro, traveled to Japan and pulled off difficult assignment of defeating Yasukio Yakushiji to win the WBC Bantamweight Title. Career included wins over Johnny Bredahl, Joe Luis Bueno and Victor Rabanales. HASIM "THE ROCK" RAHMAN: Longtime Las Vegas Resident held both the IBF and WBC Heavyweight title, and had two stints as WBC King. His first fight vs Lennox Lewis proved his biggest win with a stunning KO win in South Africa. Notable wins over Maskaev and Barrett, draws with Toney and Tua. Fought 5X in NV, including his 1994 pro debut at Caesars Palace. LEROY "IRISH" HALEY (Posthumous): Fought an awesome 49 times in Nevada, more than any current or past NVBHOF Inductee. He won the WBC 140lb title in 1983, defeating outstanding champion Saoul Mamby and repeated victory later in the rematch. He lost the title outdoors at Caesars Palace to Bruce Curry. He lived in Las Vegas throughout his career. DR. EDWIN "FLIP" HOMANSKY: Ringside physician for more than 20 years. NV State athletic Commissioner, Chairman NSAC Medical Board. MARC RISMAN: He was the attorney to Joe Louis and has represented many in boxing, including NVBHOF inductees and nominees with legal matters. Also managed Virgil Hill, Trevor Berbick and Engels Pedroza. Marc has always been a huge advocate for the sport of Boxing throughout the community. The Nevada Boxing Hall of Fame is an IRS 501 (c)3 charity and all donations are tax deductible. The Hall's charitable contributions over the seven years since its formation have helped many Nevada based boxing-related charities and organizations. Our focus remains on building a museum to honor the sport of boxing and developing programs in the community to help at risk youth as well as anyone with medical conditions who can benefit from the positive attributes of boxing. Donations are welcome. The Hall was founded in 2013 by noted boxing broadcaster Rich Marotta. For more information, phone 702-3NVBHOF, or 702-368-2463.